When Fort Myers' (FL) Kyle Yates competed against some of the best paintball players in the country two years ago, he was "not even close." Last year, he made big strides. This time around, Yates is among the elite. The Cypress Lake High graduate captured the bronze medal in men's singles, the silver in men's doubles and finished fourth in mixed doubles at the Tournament of Champions in Brigham City, Utah. He earned $1,500 in prize money. "This is a big deal," said Yates, the youngest player by six years. 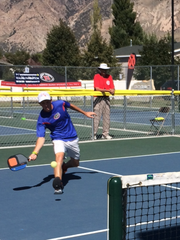 Pickleball has been gaining popularity in the United States and beyond. The sport blends tennis, ping pong and racquetball on a badminton-size court. While it has been popular with older players, younger players like Yates, 20, have been drawn to the sport. In 2016, the US Open Pickleball Championships will be held in Naples from April 26-May 1.